I recently got a new hair style. While I was with my stylist, she said wait until you try this new styling product and she rubbed a little Marrakesh Oil on my fine hair. As she styled my hair, I was totally expecting this oil to really weigh-down my hair making it even more limp and lifeless but, boy was I wrong. It helped my stylist get the “piecey” look I was wanting in my layers and it had an yummy tropical smell. As soon as I left the hair salon, I went home to do some research; I really wanted to learn more about Marrakesh hair care and see what other products they offered. I learned that Marrakesh hair care products are made by Earthly Body. Since 1994, Earthly Body has been creating natural skin and hair care products. Earthly Body products contain natural ingredients; they are free from dyes, parabens, , propylene glycol, and sulfates. Their products are Vegan and PETA approved. 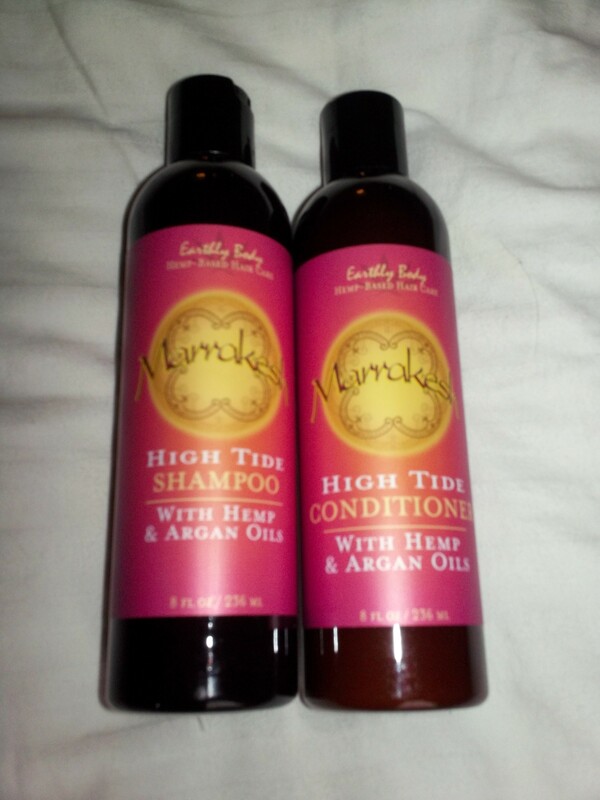 For my review, I received a collection of Earthly Body hair care products including Marrakesh High Tide shampoo, conditioner, leave-in conditioner and oil. 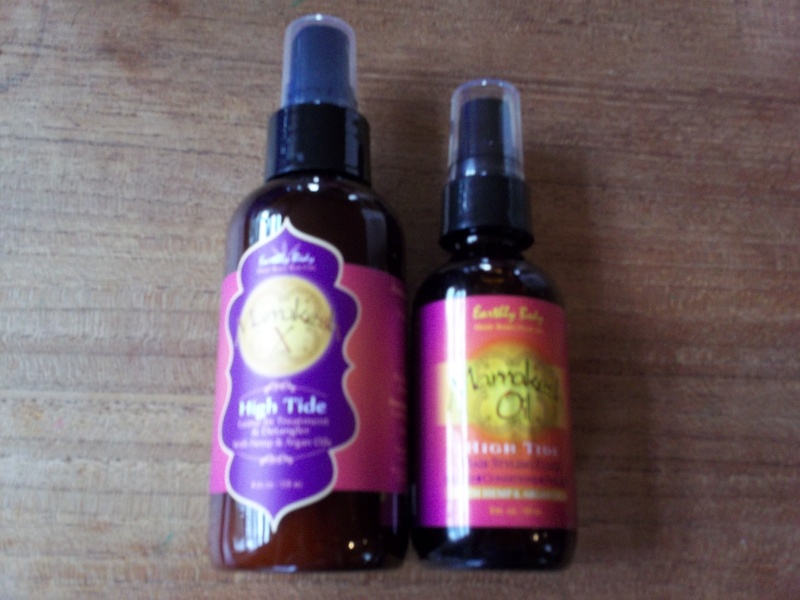 Marrakesh High Tide hair care products contain Argan and hemp oils… I am in love with products containing Argan oil. As soon as the package arrived, I opened it and tried all of the products. When I used the shampoo and conditioner together, they really helped me get volume and shine in my hair. The oil helped me style my layers getting the “full” look I was wanting. And it’s worth mentioning again, they have a wonderful tropical smell that instantly takes you to a warm beach with a tropical drink…but only for a moment. Earthly Body Marrakesh hair care products are easily one of my favorites! You can find Earthly Body products on their website, Facebook, and twitter pages. I’m definitely going to have to look into these. I have really long and thick hair and would love to find something a bit more natural to use! thanks for sharing! i am very interested in these products now, i am always on the hunt for great hair products that are natural! I love when you find a great hair product that does what it says it will! I have SUPER thick hair and the only way to tame it is to put it up in a pony! I may have to give this a try! I love argan oil! This sounds like a great product, and I’m always on the lookout for new products to try on my hair- especially when they’re natural. I’ll definitely look into giving Marrakesh products a try!